McGraw’s learning environment is inquiry-based. Students explore transdisciplinary units that connect their learning across subject areas. A range of best practices and research-based interventions are used to meet individual learning needs so that each student is challenged and supported. McGraw houses the district program for deaf and hard of hearing students. All students receive instruction in Spanish language skills. 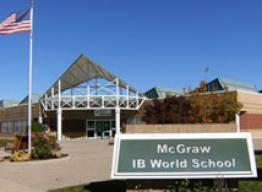 A few of the many enrichment programs at McGraw include Odyssey of the Mind, choir, student leadership team, running club, chess club, International Night, programming and robotics clubs and student-initiated community service.